History in Africa is an international, peer-reviewed academic journal that publishes original research and review essays on methodological and historiographical matters pertaining to African history. It has been at the forefront of critical discussion of these topics for more than four decades. 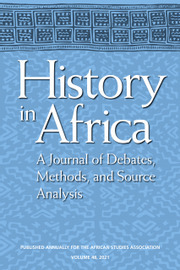 It seeks submissions that suggest new methodological approaches, provide insights into source materials, and reflect critically on themes in existing literatures or emerging fields of inquiry.History in Africa is a venue for rigorous analysis of both established and emerging research practices as well as of the resulting scholarly production about the African past. Historians, are Archeologists Your Siblings?